As we congregated in the lobby of the Globe, we had our first close encounter with another group from AHSTF. They were from Rochester, NY, and they were to be accompanying us on the tour. We introduced ourselves and each other, slowly at first, with the manner of those who want to get to know each other, but don’t know quite where to start. The tour moved out to the courtyard, where we enjoyed our sunniest day yet. After several minutes, though, the hot, direct sunlight started to seem less welcome. Luckily, the information the tour guide was imparting to us was fascinating, and well worth the sweat. She brought us through the history of the Globe (or Globes—the one that currently stands is the third incarnation of the theater). Then we had an opportunity to enter the theater itself, and to learn more about the performance aspect of the Globe, both in Shakespeare’s time and in the modern day. The tour was fascinating, and it was incredible to be in a place so full of history, particularly history I’m so passionate about. We then went to an adjoining building and had a small workshop in which we explored tactics using Shakespeare’s language. We got to work with the other group more, and it was lovely to get to know fellow actors from a different part of our country, as well as getting to learn some Shakespearean acting. 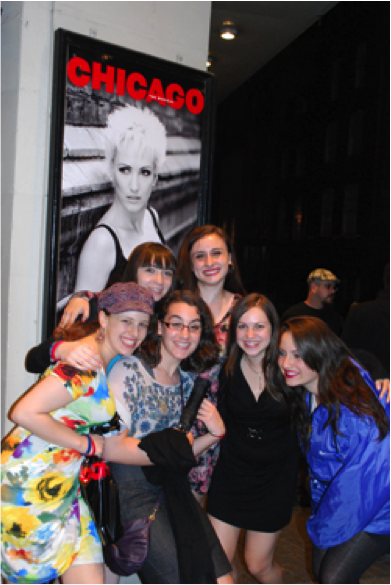 And as if this day were not amazing enough, that night we went to see the musical Chicago. Like Shakespeare, Chicago is something I’ve grown up with. I had seen the movie countless times, knew the words to every song by heart, and was unbelievably excited to see the musical for the first time ever. As great as my excitement was (and anyone on the trip can tell you how very great it was indeed), it would have been even greater had I know what we were in for. The show was very different than the movie, and this bothered me for perhaps half a song, but soon the sheer brilliance of the acting and direction overcame any annoyance of that type. The music, the dancing, the humor, the singing, the acting—the show was loads of fun. It was the perfect way to say goodbye to London. I currently write this on the train out of King’s Cross heading for Edinburgh. I’m sad to be leaving London—I had a blast—but I’m so very excited to be starting the next stage of our journey at the Fringe!